So, this isn’t the race report I wanted it to be. In fact, it’s not a race report at all. What did I want it to be? A story about learning from last year…getting the nutrition right…having fun, and rocking this thing. And getting my swag. What did happen? My right hip tightened….a lot. And somewhere between the double days at Orange Theory and the double digit miles on the trails, it tightened to the point I could no longer ignore it…or run on it. Or walk. Yeah…good times. It all started, well, I guess I don’t really know when. 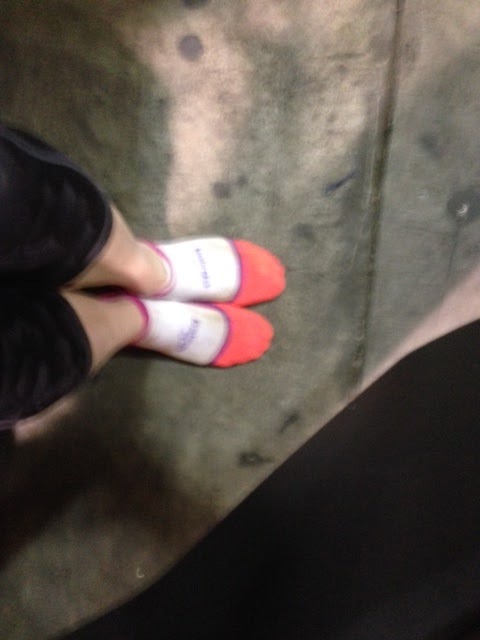 Post Giants 10k, my hamstring was tight…not the end of the world. I had a massage, and he found something in my glute…the minute that released….I knew. Ahhh…..relief. But, then the tightness moved. From the back of my leg to the front, and it was worse in the front. For awhile, I was able to push through it. I mean, what Ultrarunner doesn’t? If you run that much, something always hurts. But, it didn’t go away. Massages, doctors, days off between runs…nothing seemed to work. I tried all the stretches I learned last year when I strained all the muscles in my hip. Nothing worked. I finally went to g-sports, the PT place Brian went to fix his hip, and…progress. Actually, a lot of progress. If you’re hurting, go there. They are amazing. The leg IS healing and WILL get better. Unfortunately, not in time for this race, but making this difficult decision hopefully set me up for a future race. And, of course it’s sad…remembering my post race stumble home – exhausted, chafed, sick, but with, holy crap, I finished, on my tongue…that feeling. Accomplishment. Surprise. Finally being clean enough to pull what I thought was all of my swag out of a bag I use with every run (I found the mousepad and a wine opener a day later…yeah out of it…). But, eh…if I don’t think about it, it’s cool. My family’s here, and I love seeing my family, so instead of spending more than half the day running, I spent it with them. We spent most of the day playing tourist in the city…well, I guess I was playing tourist. They don’t live here. Anyway, we spent the day at the wharf…lunch at the rainforest cafe, museum at boudin, ice cream at ghiradelli….and I’m pretty sure more food than any human should ever eat. Haha. If you’re not going to run 50 miles, you should at least eat like you did, right?! I love my family and am thankful I got to spend the day with them. Without a race. For over a week :). Where do I go from here? The same place I feel like I always do…forward. There will be other races…there are other races. I think I’ve already found one to work towards. Cool Moon in Cool in August. I’m pretty sure my leg is just about back to normal, and August will give me time to finish healing and train back up for the race. It’s also a new race, a new adventure, and maybe just what I need. So, here’s a farewell to my spring race season, here’s to coming back and getting even with Lake Sonoma next year, and here’s to something new…a summer race, more time to train, and maybe even a new PR. I’m always excited for a weekend adventure – especially if that involves a new place with new trails. Enter a 30 hour trip to Malibu Canyon. The drive to Malibu was pretty uneventful (other than an accident that resulted in an extra hour and a half or so). Especially once I hit the 5. I talked to my parents….joked with a friend about how I needed an uneventful fifteen mile sweep after last weekend’s craziness….sang along to bad 80’s and 90’s pop….all the things you typically do on a solo road trip. Thanks to the traffic, I got to the hotel at least an hour and a half later than I planned. But never fear, it was in plenty of time to watch the poor desk guy deal with two girls under the influence of something trying to figure out if they’d checked out of their room or not. And how to use the wireless….and something about her ‘friend’ from ‘last night’. Good times. Can I just have my key? After dealing with the girls and a broken computer, I finally had my key. Then I was pretty sure I was asleep in moments. The next day started with an early Starbucks run and a joke about me even sleeping at the hotel. Thankfully the hotel, Starbucks, and the park were all pretty close, so it wasn’t that early – at least when you consider last Saturday I started running at 5. We got our caffeine and headed out to the park. As we were unloading and setting up, I noticed that the finish line was a mine-field of potholes. All big enough to see, right? Or not….at some point once the runners were off, but before I was supposed to start sweeping, I was walking over to the finish line. I avoided all of the holes in the dirt. Only to find the one in the grass…I love hearing my ankle pop. Almost as much as I love grabbing ahold of the ropes holding up the finish line arch before stumbling into the arch. Really? Right now? I tried walking it out and it was just sore, not really swollen. Nothing an ankle brace can’t fix. Perhaps I should have wished for an uneventful weekend…. And now for the course. I love getting to see new trails in new places – especially places I wouldn’t necessarily go to on my own. I had seen photos and heard it was hilly, so I strapped on my super cool ankle braces and was off. Luckily, I wasn’t feeling too sore from last weekend’s debacle of a race or from my tumble and stumble at the finish line. The first few miles were pretty gentle – some rolling hills and some flat. A lot of course markings and thanks to someone’s ‘help’, a bunch of them were gathered in piles at one of the trail heads…. Just after the two mile mark, I came across a creek. And, even with the drought, this one was flowing and probably would have come to mid-calf had I jumped right in (like I do with Redwood Creek). Somehow, I managed to navigate through on the rocks without falling in and was able to keep my shoes dry for the most part (save for my right toes….ooops). Shortly after the creek, I hit the first aid station and then began a climb that I thought would never end. Beautiful views and a nice trail, but nearly seven miles of climbing with no reprieve was a tall order. And then I was told by a mountain biker that I was at the top. So, of course I stopped to take a photo and captured the below photo. Looking back, I think the ones on the way up were better. The next few miles brought place that I could definitely jog between ribbons and observe some cool rock formations. Despite being told I was at the top, I came upon this monstrosity pretty quickly. I was pretty sure it was straight out of The Hills Have Eyes, if you’ve seen it. If you haven’t, don’t….At first, I didn’t even think it was a trail….then I saw the pink flags lining the way up it. Really? That’s a trail. Well, ok. I’m up for an adventure. And the way up actually wasn’t too bad. The way down….let’s just say I’m just glad I didn’t crash and burn. Surviving the land of The Hills Have Eyes, I came up on the second aid station. They were just as glad to see me as I was to see them. After getting high-fives from the volunteers and the ranger, I refueled and headed off on what was pretty much the last climb before a nice descent back to the finish. After what really was a nice gentle descent, the last section I hit was pretty flat. Not sure if this was a good thing or not – right around mile 13 my foot (and the rest of my body), started to make it known that they were done with this running thing. haha…almost legs, almost. Near the 10k turn around, I passed through the MASH site. It was pretty cool, despite not having watched too much MASH. I don’t think I really watched any of it until after Alan Alda was on ER and I’m pretty sure those were reruns. Anyway, I digress. I paused for a bit to get some photos before the volunteer asked me if I was planning to get in before dark. Right. Dark. Yeah, I should probably keep moving. After departing the MASH site, it was a quick jaunt back to the start/finish. A quick load of the van and I was off on the long journey home. Once I got out of LA, I was ready for some food. Enter my second Carl’s Jr. fix of the weekend. I’d also warmed up enough to want an Oreo milkshake. Yum. While I waited for the drive-thru, I decided to check out my foot again. It had been out of the brace for about an hour and felt pretty stiff. Probably because in the time it had been resting it decided to start swelling. Awesome…well, at least it wasn’t my driving leg. The rest of the trip passed uneventfully and I made pretty good time getting home. Home, showered, beered, and in bed by 12:30. Until next time….over and out. This past weekend, Brian and I escaped from San Francisco (and Fleet Week) to Susanville, home of Lassen National Forest and the famed Bizz Johnson Trail. I was heading up to work the Coastal Trails races on Saturday and Sunday, and Brian was going to help on Saturday and run the 50k on Sunday. Our Anniversary was Monday, so an adventure, a race, and some trails seemed like the perfect thing for us to do. In an attempt to miss traffic, we headed out early Friday afternoon. After sitting in traffic getting out of the city and enjoying some delicious fast food at Carl’s Junior, we made it to Red Bluff – pretty much the last large town before heading into Lassen. The first part of the park/Rt. 36 was a trip through volcanic rock. It was pretty cool and the sun was just starting to set, which resulted in some picturesque views. 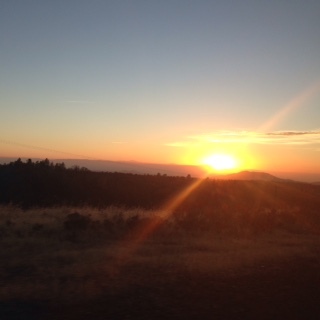 I was able to catch the below just as the sun was setting……the photo doesn’t really do the view justice. The winding roads took us through several little towns and villages that seemed to be ghost towns now, but I’m sure were booming railroad towns years ago. Then the sun set and it seemed like the deer took that as their cue to come out and play….or try to get hit by cars….or both. Too many close calls. And, as Brian said – no one wins if we hit a deer….it dies and we have another busted up car. Luckily, we made it into town safely. I had booked us at the only hotel available in town….Budget Frontier Inn, or something like that. Based on the name, I had some idea as to what I was in for, and I had fun taunting Brian with ideas around what it might be on the last leg of our trip. When we got there, I was definitely not disappointed. The outside looked as I imagined and on my attempt to check in, I found the door to the lobby locked and pressed the doorbell multiple times before someone came to let me in. Luckily, someone did eventually come and let me check in. On the walk to our room, we noticed at least one door that looked like someone had tried to kick it in…luckily, ours was in tact…or so we thought (we did find out later that side paneling left something to be desired). 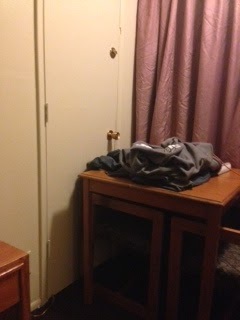 We did have a door to an adjoining room that didn’t lock…awesome. Luckily, during our years of traveling to cheerleading competitions and staying in sketchy hotels, my mother taught me well. I just took the table and pushed it against the door – at least it would slow them down. Amongst other things, we also didn’t have a remote….where is there a TV without a remote? Brian tried to find it and then I took a shot at it. No dice….but I did find this guy. Any ideas on what it is? 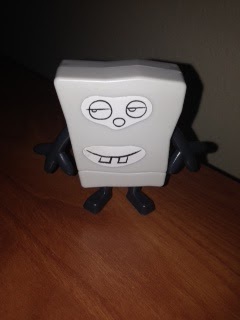 Creepy Sponge Bob? Sponge Bob on drugs? But, despite the neighbors busting into their room at two am and waking us up with the noise, it ended up being fine. We survived our three nights there and it wasn’t nearly as bad as the place in Rohnert Park a few years ago. I mean, it didn’t smell like smoke to the point that we couldn’t stay there and there weren’t drug dealers waiting for rooms when we left. Saturday morning started bright and early with check-in for the Express Half Marathon. Even earlier for us since we didn’t really know where we were and needed to get coffee/tea before getting where we needed to be (the awesome hotel also didn’t have a coffee maker….what hotel doesn’t have a coffee maker??). We had to be at the train depot at 6:15….so naturally we left the hotel at 5:15. We were five minutes away….from both the depot and the Starbucks. Only us….. But, we got our coffee and tea and made it to the depot in plenty of time. Again, narrowly missing some deer, but I digress….We worked check-in for awhile before Brian headed off to an aid station and I headed off to the finish line. It was pretty cool to be near and see signs for a trail I’d read so much about. 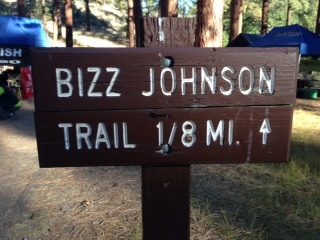 When you run marathons for nearly ten years, it’s impossible to not hear about the Bizz Johnson trail. Yes, I am a runner geek…deal with it :). I learned how to pull results – and managed to do so all day without causing any craziness on the computer….haha. So, I spent the race pulling results, posting them, and reading out age group winners. Since the only thing worse than the sound of my own voice is the sound of my own voice on a megaphone, I wasn’t sure how much I would enjoy making announcements…..However, it was actually a lot of fun. People are usually excited when they win awards, more so when they aren’t expecting it. It took me back to getting my third place finish from this race in the mail. Totally unexpected, but so fun. Once the Express Half had finished (and I’d had my fill of BBQ), I headed back up to the depot to run check-in for the rest of the day. I was surprised at how many people showed up to check in a day early – definitely helped with things the next morning. There was also some sort of chili baking competition….and festival…and I don’t know what else going on in the parking lot. What I do know is that there was a very loud band (playing good music, but still very loud…probably because they were right outside the door), and people really don’t know how to close a door. The amount of times we shut the door to keep the noise down (and what little AC there was inside), people just kept coming in and leaving it open….come on, were you raised in a barn?! Saturday night was pretty low key. We tried to find an Italian restaurant, and thought we had, but unfortunately, it was closed. So we ended up at some random pizza factory or something. And recognized just about everyone in the restaurant. We’d either checked them in for the race the next day or saw them at the race that morning. I remember one lady saying, ‘hi, expo people’….haha. Food wasn’t the best – the Round Table pizza from the night before was better, but, oh well. Win some, lose some. And really, I was ready for bed. Sunday morning started off similar to Saturday, but with a later trip to Starbucks – thank god. haha. We started with check-in, until Brian departed for his race, then he headed out and I stayed at the depot to continue check-in for the shorter distances, until those were ready to start. 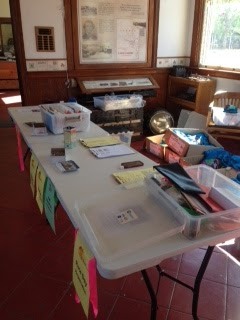 Once the races had started, I packed up everything from check-in and the depot and headed to the finish line. First, I was glad I had the x-terra – not that my car was ever an option, but that’s a whole different story. 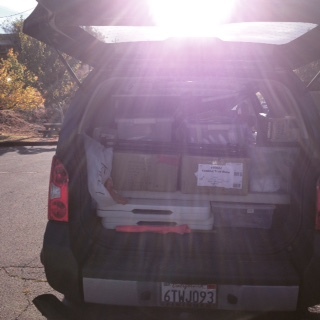 Second, I was glad I had loaded the Coastal van so many times….loading the x-terra was like a mini loading of the van….haha. But, I got it all to fit. We bid farewell to the lady at the depot, and we were off. I spent most of my time at the finish line on Sunday like I spent Saturday….pulling results and announcing age group awards. Again, it was a lot of fun….people were in disbelief that they had placed, so it was fun being able to make their day. Brian had a great race – PR in his 50k and first in his age group. It was fun to announce his name and give him his first place medal. I also got to take Brian on a trip in the Coastal van….always a good time. Thankfully, he’s good with directions and was able to prevent me getting us lost. We did pass a car that had just hit a deer….really glad that wasn’t me. We picked up all the aid station stuff at one main gathering place – I thought I was being slick and got the tables in…thinking we wouldn’t have to unload them again. Of course, I forgot about the timing mats. Not that slick….apparently I haven’t loaded the van enough times…haha. Once that was done, we headed back to the finish line, broke down, loaded up, and were off…until the next race. We celebrated Brian’s good run with some more Round Table pizza (what else do you eat in Susanville? ), some wine, and an early bedtime. We were really excited to sleep in the next morning, but disappointed our time away had come to an end. Such a great weekend getaway….. Overall thoughts – great trip, great race – highly recommend. I’d pick a different hotel though…or as Brian said, maybe next time we can see if we can find a worse hotel to stay at…haha…. Until then, over and out….